With the latest front entrance door ranges for your home from Hormann. These doors are available in Aluminium or Steel, the ThermoSafe, ThermoCarbon and Thermo doorsets offer a wide range of designs and finishes to turn any house into a home. With the highest grade security and insulation levels, you will be sure to find something to match your home in a pleasing visual way. Security specifications are also available for many of the entrance doors for total security and peace of mind. With different locking mechanisms and a stylish exterior, unmatched insulation, a Hormann front door is the top class. With almost any colour available to match the style you choose, this can mean you can specify a door to satisfy the most demanding requirements, whether security, colour, design or insulation. Hormann Entrance Doors can be categorised into two different groups - Aluminium entrance doors and bespoke Steel entrance doors, in a variety of choices. Available in a range of different colours and finishes, Hormann front entrance doors for homes and offices are ideal security functions. You may well see a design in both ranges very similar but the build and options are very different indeed with the aluminium doors being almost totally specified from the threshold upwards whilst the steel doors have more limited options but still surpass all expectations of a high quality entrance door. The insulation levels of these doors is exceptional by any standards in UK or Europe. Hormann Entrance Doors are available in a large selection of designs, finishes and styles. Having manufactured front entrance doors for well over 50 years, including the sale of 13 million doors worldwide. Hormann have becom experienced specialists in the front entrance doors market. All of their products are produce with the same ideology of "Quality Without Comprimise" which as earned them the spot as number 1 in Europe as manufacturers for so many years. Entrance door is a key element of house facade. Every day You see, touch and use it. Door must be safe, warm, maintenance free and match the exterior. 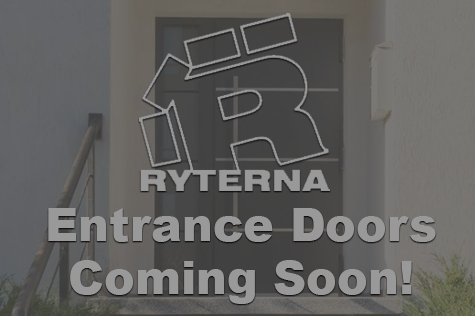 Ryterna offer a wide range of made to measure doors with numerous design choices including possibility to create Your own design. Latest technologies combined with perfect design results outstanding appearance and performance.